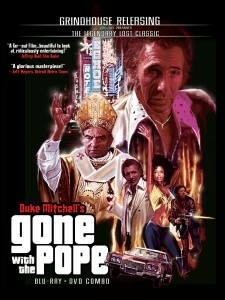 Grindhouse Releasing Sets ‘Gone With the Pope’ Blu-ray/DVD Release! AT LAST! Grindhouse Releasing proudly presents the legendary lost classic! I WANT A DOLLAR FROM EVERY CATHOLIC IN THE WORLD! Lost for over 30 years, GONE WITH THE POPE stars famed nightclub performer Duke Mitchell as Paul, a paroled gangster with an unholy scheme: to kidnap the Pope and charge “a dollar from every Catholic in the world” as the ransom. Shot in 1975, GONE WITH THE POPE was unfinished at the time of Duke Mitchell’s death in 1981. Sage Stallone and Bob Murawski of Grindhouse Releasing rediscovered GONE WITH THE POPE in 1995 and vowed to save it from obscurity. Academy Award-winning film editor Murawski (THE HURT LOCKER, ARMY OF DARKNESS) spent 15 years completing GONE WITH THE POPE from the surviving film elements. Grindhouse Releasing proudly presents the Holy Grail of exploitation cinema! GONE WITH THE POPE has screened exclusively in cinemas since its sold-out Hollywood premiere in 2010. This home video debut follows Grindhouse Releasing’s Blu-ray/DVD release of Duke Mitchell’s MASSACRE MAFIA STYLE, now set to arrive Feb. 24 along with the company’s long-awaited Blu-ray edition of Lucio Fulci’s THE BEYOND. Grindhouse Releasing will celebrate the upcoming Blu-ray/DVD releases of MASSACRE MAFIA STYLE and GONE WITH THE POPE with a rare 35mm screening of both films Feb. 10 at the New Beverly Cinema in Los Angeles. Duke Mitchell’s MASSACRE MAFIA STYLE and GONE WITH THE POPE are two of the most long-awaited and requested titles in the Grindhouse Releasing home video catalog. Founded in 1996 and known as the Criterion of cult cinema, Grindhouse Releasing has released Blu-ray editions of THE SWIMMER, starring Burt Lancaster, THE BIG GUNDOWN, starring Lee Van Cleef and Tomas Milian, CORRUPTION, starring Peter Cushing, and AN AMERICAN HIPPIE IN ISRAEL, starring Asher Tzarfati and Shmuel Wolf, The company scored a #1 best-selling hit in 2014 with its deluxe Blu-ray release of Ruggero Deodato’s notorious CANNIBAL HOLOCAUST. Grindhouse Releasing is also one of the most prolific theatrical distributors of classic horror and exploitation films in the United States. THE BEYOND, CANNIBAL HOLOCAUST, the midnight hit TRAILER APOCALYPSE and other Grindhouse Releasing titles are all making the rounds of of cinemas across the country now. For theaters and dates, visit www.GrindhouseReleasing.com. GONE WITH THE POPE Deluxe Edition © 2015 Grindhouse Releasing, Inc.
Grindhouse Releasing Presents Duke Mitchell’s MASSACRE MAFIA STYLE! Grindhouse Releasing is proud to present the definitive release of Duke Mitchell’s MASSACRE MAFIA STYLE, arriving on DVD and Blu-ray disc February 10, 2015! Pre-order MASSACRE MAFIA STYLE at Diabolik DVD! Italian-American actor and nightclub singer Duke Mitchell wrote, produced, directed and starred in this homemade answer to THE GODFATHER, self-financed with earnings from his career as the self-proclaimed “Mr. Palm Springs.” Previously known for his Martin and Lewis act with Sammy Petrillo as seen in BELA LUGOSI MEETS A BROOKLYN GORILLA, Duke plays the ruthless son of a Mafia kingpin who blasts his way through Hollywood on a bloody crime spree. Promising “more guts, more action, more dynamite” than the Mario Puzo gangster classic, MASSACRE MAFIA STYLE delivers an onslaught of low-budget mayhem unlike anything you’ve ever seen. Watch for Grindhouse Releasing’s Blu-ray release of Lucio Fulci’s THE BEYOND, coming February 10, 2015! 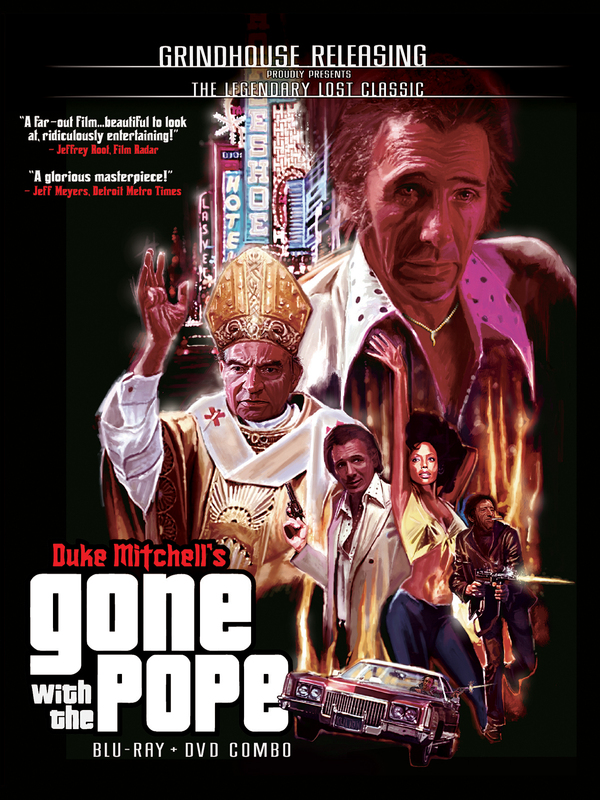 And stay tuned for details on the long-awaited Blu-ray and DVD release of Duke Mitchell’s GONE WITH THE POPE!